Three large bedrooms sleeps eight people, includes two Double beds and four single beds. (Please bring your own cot.) Separate lounge and Full Kitchen with Fridge Stove oven and microwave. BBQ outside on request. This 1929 Red brick cottage was built to give the Light house Keepers family indoor bathrooms, Toilet and Laundry facilities. The old fashioned Pull the Lightcords are still in place. Eight people can sleep in two queens size beds and four singles in three large bedrooms. There is a separete toilet shower and bath in the bathroom, a full kitchen with all the modern facilities. 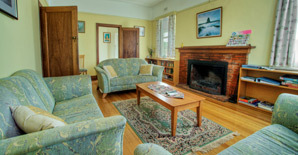 The lounge room has reverse cycle heating and cooling and also the open fire place has been restored. You enter via a Sun Room which is very cosy in the winter. A two minute walk and you are standing under the Lighthouse over looking Bass Straight 80 metres above sea level. It is recommended you bring you own porta cot if needed. Lovely Single bedroom cottage with queen bed and two single beds. Fully self contained with kitchen and lounge room and private bathroom facilities. 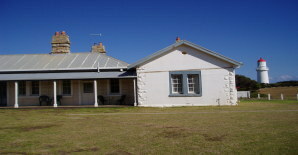 This 1887 timber cottage was added to the lighthouse keeper grounds to reduce the 12 hour shifts the other three lighthouse keepers endured in the Lamproom. It is very comfortable for a couple or Mum Dad and two children, with a queen size bed and two singles in a large bedroom. A separate lounge room off the bedroom, a full kitchen with all the modern facilities, separate bathroom and toilet, with reverse cycle heating and cooling, makes this a very cosy getaway. Step out the back door and take 20 paces to your own lookout 80 meters above Bass Straight. It is recommended that you bring your own porta cot if required. Motel style room off main veranda of Head lighthouse keepers cottage. Ensuite bathroom, Queen size bed. BBQ facilities available. Tea and Coffee facilities with Microwave oven and fridge, Air conditioning and heating in a cosy environment. From your window you’ll see open bushland surrounding the Light Station.. A short stroll to magnificant Views of Bass Strait. Three bedroom Cottage which includes two Queen beds and four single beds. Original 1859 Limestone cottage with separate lounge with an open fire place and Full Kitchen with Fridge Stove oven and microwave. BBQ setting available outside. Large Veranda looking to a bush setting, two minute walk to ocean views of Bass Straight sitting on top of 80 metre cliff. Heating and Air conditioned for your comfort. This 1859 Limestone Cottage was first constructed in 1857 and completed in 1859. Three very large bedrooms offer eight people a sleeping arrangement with two queens and four singles. Two bathrooms and two toilets make the living conditions very comfortable. There is a separate kitchen with full cooking facilities and a dining room for eight people. The open fire place has been restored in the lounge room to give a cosy atmosphere. Each bedroom has its own heater and we have an air conditioner for the summer months. 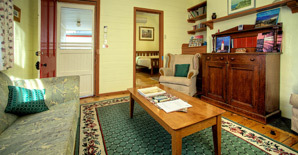 The Cottage has its’ own charm with todays’ modern facilities. It is recommended you bring your own porta cot if required. Cape Schanck Lighthouse | Proudly Powered by WordPress.